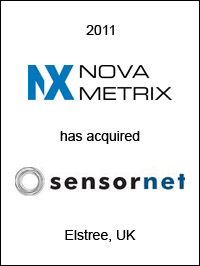 Nova Metrix LLC, Woburn, MA, has acquired Sensornet Ltd. based in Elstree, Hertfordshire, United Kingdom. Sensornet provides the world’s most advanced asset monitoring solutions using real-time distributed temperature and strain measuring systems. “With this addition to the Nova Metrix portfolio, we’re able to further enhance our range of asset monitoring products and services by strengthening and consolidating common technologies with existing portfolio companies such as Roctest Ltd. and Durham Geo Enterprises, Inc.” said Jim Barbookles, Chairman and CEO of Nova Metrix. EC Mergers & Acquisitions acted as exclusive financial advisor to Nova Metrix on this transaction.